The authors of stunning new study on climate change in the Middle East start off with a very symmetrical observation: The region that gives the world so much of its fuel could be made dangerously hot by the emissions created by that fuel–unless we as a planet decide to mitigate our CO2 emissions. The study, published today in Nature: Climate Change by Loyola’s Jeremy Pal and MIT’s Elfatih A. B. Eltahir and first reported by The New York Times, looks at how increasing temperatures will affect southwest Asia in particular. Their results show that if climate change continues without reform over the coming decades, much of the Middle East will regularly endure extraordinary heat. The research was carried out by comparing a standard model of carbon emissions over the next eight decades with the heat that human bodies can bear. The question with any predictive research on climate change is what model of emissions to use–will humanity get it together and turn this ship around, or will we continue belching carbon dioxide apace? That’s why the science community (led by the UN) has a set of standardized models called Representative Concentration Pathways, or RCPs, that represent four possible models for emissions over the next 85 years. For their study, Eltahir and Paul used two of those future scenarios. One, called RCP 4.5, imagines what CO2 emissions would look like by 2100 if humans start mitigating efforts to reduce greenhouse gases–eg, if we start cutting back. The other scenario, RCP 8.5, is the nothing-changes version of the story: If the world keeps emitting the amount of CO2 at the rate we are now. Another baseline they had to establish? The exact level of heat and humidity a human could reasonably be expected to survive on a regular basis. They used a type of measurement called “wet bulb” heat, which is a complex concept that the authors simplify by describing it as “a combined measure of temperature and humidity, or ‘mugginess.” They pegged the maximum survivable temperature at six full hours of 35 Celsius or 95 Fahrenheit. Anything above that “would probably be intolerable even for the fittest of humans,” the write. Which is what makes their projections so disturbing. Using RCP 8.5–aka the IDGAF scenario where emissions continue at the current rate–their model showed that a large portion of the Persian Gulf would exceed that maximum threshold of wet bulb survivability, especially over the Red Sea and the Gulf. They give a couple of reasons for this hot spot, like the fact there’s rarely any cloud cover. And it’s also worse because it has a low rate of “albedo,” a term that describes how much sunlight reflects back up into the atmosphere. In this super-heated future, it would be extremely dangerous to spend time outside. 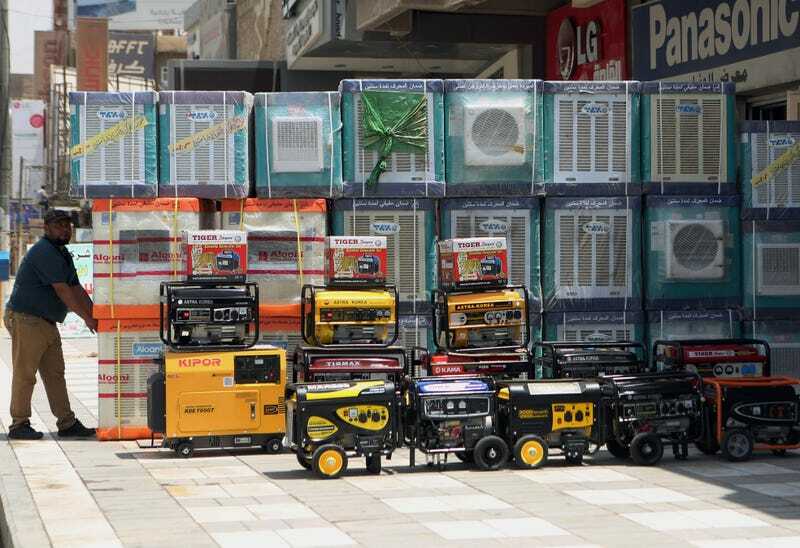 “Even the most basic outdoor activities are likely to be severely impacted,” say the authors, who note that the conditions would have “severe consequences” for millions of pilgrims who make the Hajj to Mecca, which already uses substantial cooling technology like misters and air conditioners to cool pilgrims, like those seen below. Water is sprayed over Muslim pilgrims in Mecca this September. AP Photo/Mosa’ab Elshamy. And even for people who aren’t spending much time outdoors, access to air-conditioning will be absolutely crucial–which puts the poor at particular risk. “Under such conditions, climate change would possibly lead to premature death of the weakest–name, children and elderly,” they write. And this isn’t a distant future: It’s one that many of us will live to see–if, again, carbon emissions continue unabated. Meanwhile their models showed that even if we mitigated emissions a bit, down to the RCP 4.5 standard, the Middle East would be significantly less impacted. Is this enough to scare us into change?